Many of you regular readers (I know I have at least a couple of you!) 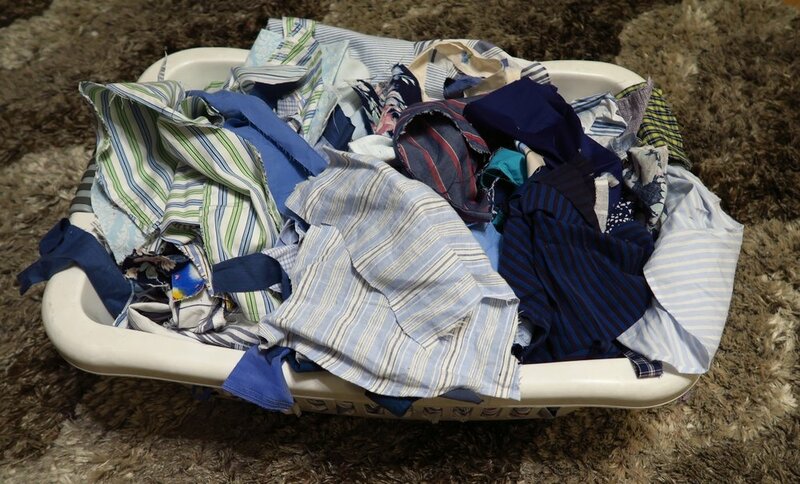 realize that I've been trying to get my upcycled blues down to only 2 plastic boxes - of pieces of mostly men's shirts, but not only men's shirts - some ladies' clothing as well - down from 6 boxes. As a result, so far I've finished 7 tops - I am planning to show number 7 on Tuesday. I have number 8 in strips, ready to be made into blocks - sitting at the machine. Then I've started number 9 - which I have to admit, I'm struggling to find pieces big enough to use. That's good, though...very good. Number 10 is a crumb quilt - I will show my weekend progress on that on Monday.. Number 11 maybe something like a t shirt quilt made of various sizes of blocks. We'll see. That one will be a fun challenge. I'd like to use up a variety of sizes of pieces I've collected. Let me show you. I wouldn't use up all the pocket pieces or the yokes - but make a quilt of a mishmash of all of the above. Figuring out the layout might be the hardest of all. Then, today, I started actually going through the 'dregs' of what I had left and began cutting it all into 3.5" square and 2.5" squares. This is what I'm talking about - I'm cutting it up after I cut up up what I need for top number 8's strips. It's tedious, though, and I cut for an hour or so today until I just couldn't anymore. I just realized however, that possibly I shouldn't cut them up into these squares until I finish planning the t-shirt type quilt layout made of various sizes of blocks! I actually do have one last one in mind to make from my 3.5" squares if I can get enough out of them to do it. And the 2.5" squares? I'm just cutting those up because they are a nice size to have. Anything that won't make a 2.5" square is being thrown into the strips/crumbs box. One of the secrets I have for being productive is to stay "in love" with what I'm doing. I try to stay engaged, interested and focused. When I find myself bored I find that I need to change my focus - possibly start another project - or else I begin to look to do anything else except the project I'm working on! That's not an effective way to sew, though I do tend to spend more time picking up around the machine and cleaning up the floor during those moments - which is a good thing! Sometimes I have to trick myself to keep myself engaged. Today I started choosing backings for these upcycled tops. Why today? Well, a good bit of the reason is that all this upcycled fabric is in my daughter's room and I will feel funny barging in on her once she is here - so I'm trying to plan it out now. Here are my two boxes that have mediums/darks and light blues. They aren't packed tightly and I could add more to them if I need to, or I could go ahead and use these if I find myself short of supplies for the remaining planned and 'in the process' tops. I do know that I will use up all of my blue duvet covers and bigger pieces of upcycled blues. In fact, I don't really have enough to make backings for all these quilts. But I'll probably just find something that contrasts nicely and use that. I do have a nice box of scraps to make my crumb blocks with though. I truly fear that I will have enough small and weird shaped pieces that I could probably make 2 crumb quilts out of them. But I'm starting with one - I'll tackle a second one on the weekends if necessary - as I"m beginning to grow very tired of these blue fabrics. Most of what I think of as pretty fabrics are used up and I don't feel like dealing with more stripes! But I'm getting closer and closer to my goal, and when I get close enough to actually feel like I'm almost done, I'll start working extra hard. In the meantime, if I just keep plugging away at these blues, I'll make them change shape - from piles of scraps to a pile of quilt tops and then eventually, finished quilts. That's exciting! Of course, I enjoy the process or I wouldn't do it, but I also love to have something pretty to look at when I'm finished! And now you've got the low-down on my upcycled blues project - everything from what I've done to what I hope to do. Don't forget to check out what my sister has for you over in the shop. She may have just the perfect fabric for you!